Our ferrets are not deprived. They have a giant plastic container filled to the brim with various kinds of old sweatshirts, sleeping bags, round pet beds, fuzzy blankets, and other such things designed especially for them to nap in. Riot seems to be asserting his nine-tenths of the law. the rule of pets is they know better than humans. i find the best cat toy is a ball of their own hair i make w/ a little spit. 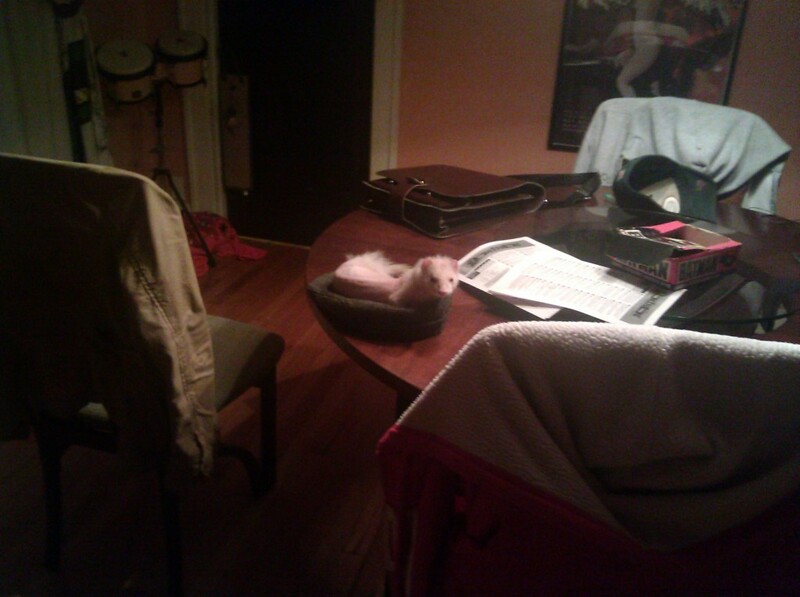 My cats never get on the table (when I’m there to see) unless one of my hats is on the table, in which case CATBED! I bought a catbed for my cats. Other than the fact that my dominant cat slept on it once to make sure it smelled like her, they ignored it. Instead, they have my bed, my chairs, my laptop case (if open) and a giant mogu pillow which is now officially a cat bed. Looks like ferrets, the same way cats drive me crazy, find a container that is too small for them to fit into and then fit into it anyway.